In addition to its namesake brand, Elizabeth Arden is known for celebrity brand perfumes such as those of Taylor Swift. Revlon said Thursday it is buying Elizabeth Arden for about $419.3 million in cash, a deal uniting two well-known names in the world of beauty and cosmetics. Arden shares surged 49 percent Friday, while Revlon's stock gained more than 6 percent. The New York company is paying $14 for each Elizabeth Arden share, a premium of 50 percent over their closing price Thursday. The companies value the deal at $870 million including debt. Revlon said the combined company will benefit from having a presence in more markets worldwide. It expects savings of about $140 million from the combination. Company founder Elizabeth Arden opened her first Red Door salon on New York's Fifth in 1910. The company, now based in Miramar, Florida, sells skin-care and fragrance products in 120 countries. It was in the midst of trying to turn its business around and posted a loss of $28.4 million on revenue of $191.9 million in its most recent quarter. Revlon was founded in 1932 with the launch of nail enamel. It posted a first-quarter profit of $11 million on sales of $439.6 million. It has a new chief executive, Fabian Garcia, who came over from Colgate-Palmolive in April. Scott Beattie, Elizabeth Arden's chairman, president and chief executive, will join the Revlon board as non-executive vice chairman and serve as senior adviser to Garcia. The companies expect the deal to close this year. 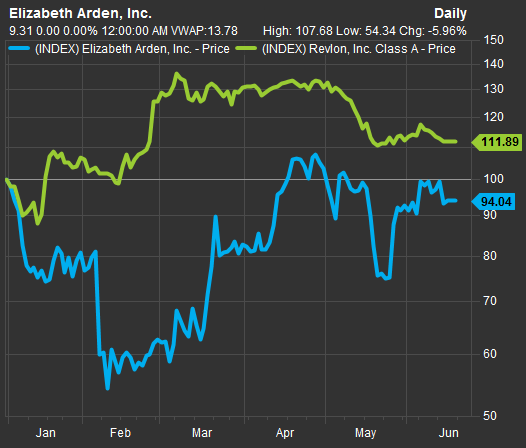 Entering Friday's session, Arden's stock was down 5.96 percent year to date, while Revlon's was up nearly 12 percent in the same time period.